A recent conversation I had on Twitter got me thinking about my ten-year-old’s horror kick lately. She’s been dying to be let loose on the R-rated vaults so she can have full access to some of the scariest and most vile horror flicks out there. Simply put, she wants to be terrified. And while I have to admit the apple doesn’t fall far from the tree, the mom in me has to temper the urge to share my love of horror with the fact that she’s, well, ten. Oh and it doesn’t help my decision any that I’m sure she would tell every neighbor kid (and their parents) that “My mom let me watch [insert gory/inappropriate horror flick here] last night”. We started off slow with a little Signs by M. Night Shyamalan (you’d laugh if you heard me try to pronounce his name, by the way). Our thinking was that it’s freaky, but not really scary. Yeah…she practically yawned. 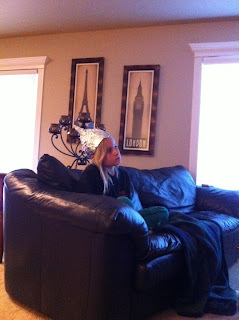 Don’t get me wrong, she fashioned her tinfoil hat with the best of them, but the fright factor just wasn’t there for her. She needed more. Next up, Poltergeist. We even watched while we were camping in the woods thinking this has got to scare her, right??? What I remembered about it: Scary clowns, a monstrous tree that attacks, and Carol Anne’s creepy voice as she announced, “They’re here.” What my daughter saw: Lame 1980’s special effects. Period. Let’s just say, she slept just fine. Okay, so we break out the big guns. Well, big guns for a ten-year-old, and decide to let her watch The Sixth Sense. Ghosts, gruesome corpses, the whole nine yards. Her take: It was cool. Kinda creepy. Not really scary, though. So the other day we’re walking up to the front door and she tells me that in order to kill a zombie you have to do a “double tap”. So I haven’t seen Zombieland, but I’m thinking it’s a little worse than PG-rated Poltergeist. But it also got me to thinking about what my favorite horror movies of all time were (not that most of these are on the potential list for my daughter’s eyes…yet), and I decided to make a list. So, what do you guys think? Suggestions for my ten-year-old. Suggestions for me. What are some of your all time favorite horror flicks??? Not so cool part of the movie: the DVD has a different ending. Like, completely different. I verified this with others who saw the theatrical version, so I know I'm not crazy. Aaaaand, none of the alternate endings on the DVD are the exact one I saw in theaters. Complete bummer since the theatrical ending was my favorite. I'm so not a horror watcher, I can't stand it. What scared me the most was The Ring, I had to sleep with a light on for a month after and I think I was around 16. I personally can't stand zombies, they scare me. I'm a fairly easy scare so I'm not much help, best of luck to you. Zombieland isn't scary but so funny! Very gory tho your kid has got some guts lol! Good topic. I thought Prom Night and Boogeyman were kind of scary when I was younger and they're both age appropriate I think. The Ring TERRIFIED me. That little girl crawling out of the television... I still shudder just thinking about it. And I refuse to see The Exorcist, because the bits and pieces I've seen so far were traumatic enough. I've also heard The Grudge is pretty horrific. This is an interesting topic for me--mainly because I used to basically refuse to watch horror movies...and then I took a horror film class last winter. Let's just say, I can watch horror movies now! Paranormal Activity. You're right about this one. If you're freaked out about waking up to things standing by your bedside, staring down at you, don't watch this. It ruined my life for like 3 months after I watched it. This is by FAR the scariest movie I’ve ever seen. The Descent. This was the ONLY movie we watched as a class where there was a big scream from the audience. For me, it was one of those movies that was freaky while I watched it but didn't bother me afterwards. LOVE those movies. The Ring. I have to admit, at the time I watched this (was probably about 13) it really, really scared me. Now, I don't think I'd really have a problem with it. Saw. Again, I watched this when I was younger, but it was definitely one that freaked me out for a while. The whole goriness of it got to me. Arachnophobia. This one also kind of ruined my life, but that's only because I am somewhat terrified of attacking spiders. I cannot fathom why I thought it was a good idea to watch this movie! I haven't watched this in years but Child's Play freaked me out when I was younger. I saw that when I was probably about your daughter’s age, and I REALLY didn’t like scary movies. And I’m not in therapy, so it’s probably safe for a 10 year old that does like scary movies! The Mist. This one wasn’t all that scary but was scary-enough. I think a 10 year old who’s into scary movies might find this one fun. Cloverfield. Again, not all that horror-film-esque, but definitely one that you might consider freaky. The Village. Also not a horror movie exactly, but one that’s kind of scary WHILE you’re watching it. I'm drawing a blank for good scary movies for a 10 year old, but I have to tell you that both Paranormal Activity and The Exorcism of Emily Rose aren't all that scary. PA is more about the creep factor. The creepiness builds and builds, but I didn't find it scary at all. TEoER wasn't scary to me either. It has a lot of courtroom drama and I thought it took away from what could have been superbly freaky. The Fourth Kind is good if your daughter likes aliens and I remember Silent Hill freaking me out. I've also been told that Indsidious is scary as hell, but I haven't seen that one for myself yet. Good luck on scaring your offspring! Your daughter rocks! I was a HUGE horror fan starting from about age nine on. I was actually much braver at ten than I am now, which is weird. My all-time favorite is still Poltergeist. To this day. It's the perfect horror film. LOVING this topic Kim! Ok, so here are my suggestions fot your daughter. Prom Night: This is a slasher movie, its a bit violent from what i can remember m. But it was a pretty good movie! Really tense at times! Final Destination: Ok this movie is really gorey!! Its not so much scary but it has really creepy eerie moments!! So I was (still am) exactly like your daughter except that my Dad did not give a crap about what other people thought. So at the ripe old age of 8 he sat me down and made me watch Child's Play. That's right. Chuckie with a potty mouth and a knife. From the moment I laid eyes on Chuckie I was hooked on scary movies and I can remember sitting on the couch huddled next to Dad watching every scary movie we could get our hands on! Lots of the other comments have great suggestions, but I can't think of any that are age appropriate..probably because I didn't watch appropriate movies at that age hehe! Good luck! Your daughter definitely has more guts than I did when I was 10! I was about that age when I saw Signs for the first time, and I was so scared I was crying! I love that so many of you were scarred by Chucky. There's something about creepy dolls...I still get freaked out by the Talking Tina doll from the old Twilight Zone episode. Yeesh! @Kristina - The Ring is one of the all-time greats! @JessicaLou - I forgot about the Boogeyman. Thanks for the recs!!! @Gina - YES, The Grudge...how could I forget that one?!? That probably should've made the list. @Kate - Thanks for the Dr. Who rec, I've heard really good things about it. I think we'd love it!!! @ShirleyShimmer - OMG, I still don't think I'm over Arachnophobia. And I'm totally getting it for her...awesome suggestion! Also, someone else just told me about The Descent, I'll definitely have to check it out. Nikki - Haunting in Connecticut and Insidious are both movies I've been wanting to watch, so I'd probably better get on it. THANK YOU! @KimHarrington - I don't remember The Changeling, I'll have to look it up. A LOT of those movies that were scary back then, totally lose their OOMPH when you re-watch them today. The special effects just fall short. I still love Poltergeist though! @Buster - I think I actually OWN The Strangers and still haven't watched it...totally have to now. That seems like one I'll have to pre-screen before letting my daughter watch it though ;) P.S. Thanks for making me think of all these great flicks!! @chasing empty pavement - I'm sure some people think I'm a bad mom for even trying to "scare" her. LOL! @Emily - Aw, poor thing! I went through a horror phase at her age, I think horror movies aren't what they use to be but these always scare me. The movie that seriously creeps me out is The Grudge. Watch it and you will forever hate stairs. I don't scary easily at all. I might get creeped out or grossed out, but not much scares me. There are two movies that TERRIFIED me. The Strangers - Couple is in an isolated house, three complete strangers wearing the creepiest masks EVER start terrorizing them. I'm scared to be home alone, because I'm so convinced every noise is going to be a creepy masked person. Oh, and the masked-people don't talk the entire time! (Well, until the end.) It's based on a true story, even without knowing that it's so realistic it's terrifying. Insidious - I went into this one thinking I'd be kind of creeped out . The main scary guy didn't phase me, what scared me were the random ghosts. They would stand around with creepy smiles on their faces, completely frozen-think really demented clowns. I had nightmares in which I'd be walking around a totally dark area and would randomly bump into one of these ghosts. I'd be cautious about letting my daughter watch either without screening them first, but they are sure to creep her out at least a bit. I am not really a fan of scary movies. In fact the only one I have really seen was the new When a Stranger Calls and I saw it on a bus with 15 other girls in the middle of the day and we were yelling at the girl the whole time because she was being stupid. Like you go outside really? Needless to say it wasn't exactly scary but it was some of the most fun I'd had in a while. That's my one and only experience with scarey movies and I think its going to stay that way.